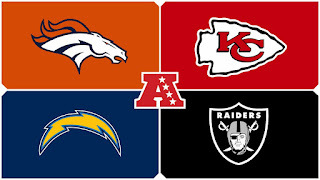 The AFC West might just be the most competitive division in the conference. The Denver Broncos own one of the top defenses in the NFL while the Oakland Raiders have one of the most prolific offenses in the league. The Kansas City Chiefs are starting a rookie RB, but are always a threat to claim a Wild Card spot. The Los Angeles Chargers have a new home, but they have been nothing but average to slightly below average for quite sometime now, as injuries have derailed them in recent years. The Broncos are 5-1 against the Chargers in their last 6 meetings, beat the Raiders four times in the last 3 years and lost their last three games against the Chiefs, after winning 3 in a row. After losing both games in 2014 to the Chargers, the Raiders have won four straight. Oakland plays back-to-back road games three different times this year, including the final two weeks. They play 4 games in the Eastern Time Zone. The Broncos have it even worse with three straight road games in weeks 7-9. They also have two other back-to-back road games on their schedule. The Chiefs do not play back-to-back road games as they have a bye week 10 between games with at the Cowboys & Giants. They do however open the season against the Patriots in New England. Los Angeles has to travel across the country for games against the New York (both teams), New England & Jacksonville. The Raiders don’t have a tough home game until the Chiefs visit week 7. They have a tough second half home schedule with games against the Patriots, Giants and Cowboys in a 5 week span. Denver gets four home games and a bye week before week 7! They will host the Patriots and Bengals in weeks 10 & 11. The Chiefs don’t have back-to-back home games until they get three in a row from week 14-16. They host the Steelers in week 6. San Diego will host three home games in a row from weeks 2-4. They host the Patriots in week 8 and the Cowboys in week 12.